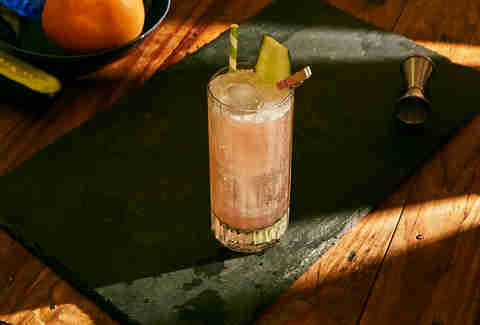 The highball: so simple it’s almost the definition of the cocktail, and yet host to endless variations where spirits can show off their complexities. As basic as a soft drink nesting the liquor of your choosing, it can nevertheless pull from a small garnish or rim to exhibit the best qualities. To keep summer cool, we asked bartenders around Miami and Chicago for their thoughts on what makes the highball great… as well as a few recipes featuring Brugal rum. 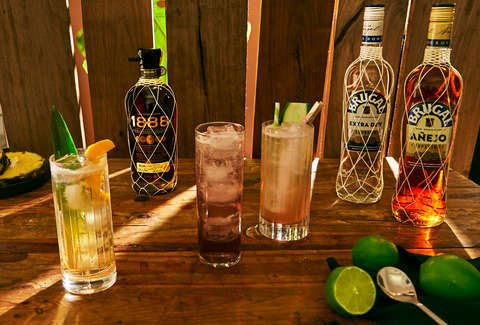 Michael Albuerne, head bartender at The Local Craft Food and Drink in Coral Gables praises the rum highball as, “complex simplicity at its finest. The most common rum highball from my experience has to be the good ol’ rum and [cola]. Two simple ingredients, a carbonate, and a rum of choice. However, when poured over ice, the two pair famously. A rum highball in my eyes is the businessman’s cocktail. Fast, efficient, and most importantly: enjoyable." But it’s not only businessmen enjoying the highball. In a scene full of beautiful architecture housing beautiful people dancing to hot music, the cocktails in Miami still dominate. And it’s thanks in great part to the work of Cocktail Cartel Co., the trio of bartenders whose work “embodies laidback Miami swag and big-city sophistication.” Manuel Picon, Eddie Fuentes, and Hector Acevedo create outrageously exciting drinks that ought to be considered sippable fine dining for Miami’s biggest hotels, restaurants, and bars. Cocktail Cartel says highballs should be "tall, dark & delicious.” Their recipe achieves this by combining an earthy fruit to a surprisingly bright mixer: “an ingredient that we incorporate daily in different expressions, Grapefruit. It's used/grown in large quantities in/around the Caribbean and Florida. 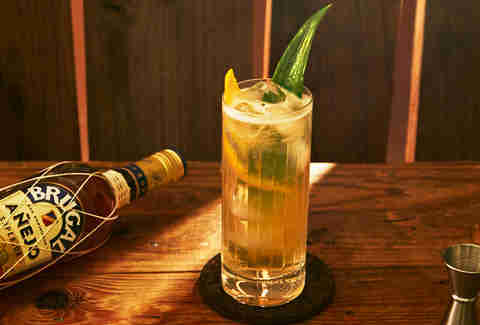 We highlighted it in our soda component, then paired it with cucumber, which dance very well together." 1. Chill a 10 to 12-ounce highball glass in the freezer a few hours before mixing. 2. Remove glass from freezer and add ice. 3. Clip cucumber to glass with a mini clothespin. 4. Pour Brugal 1888 over ice. 5. Add grapefruit soda to top. For Pablo Madrigal, head bartender at The Bristol in Chicago, the highball’s simplicity evokes personal memories. “Learning how to drink in Mexico meant essentially drinking everything and anything in highball form,” he says, “from Cuba Libre and whiskey soda all the way to ‘Charanda” (an oftentimes questionable sugarcane distillate) mixed with whatever bubbly companion was available. However, the absolute constant iteration was the rum highball. Rum, [cola], and sometimes soda, called ‘Campechano,’ is to this day the drink of choice among the younger crowd in Mexico’s bar scene. Azrhiel Frost, bar manager at The Gage overlooking Millennium Park, takes that lime note a step further, pinning it to exotic floral and nut flavors. 1. Infuse Brugal rum with Butterfly blue pea flower tea in advance of preparation. 2. Mix lavender and kola simple syrups (or infuse your own in advance) in equal parts. 3. Combine infused rum and syrup over ice in a shaker, then stir. 4. Pour over ice into a collins glass. 5. Add soda water almost to top. 6. Present to drinker, and add lime juice; the acidity of the lime will change the blue of the tea to purple in a creative serving flourish. 7. 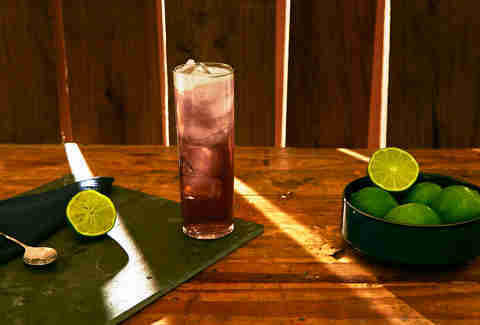 After a moment, stir the drink to mix in the lime juice and serve. Of course, when making a traditionally quick cocktail, you don’t always go for the gusto of infusions and wardrobe changes. That’s when you can still enjoy delicious, layered flavors of sweet and sour in a fast fashion, like this beachy version from Katie Renshaw, bartender at Drumbar in Chicago, and winner of last year’s Speed Rack competition.